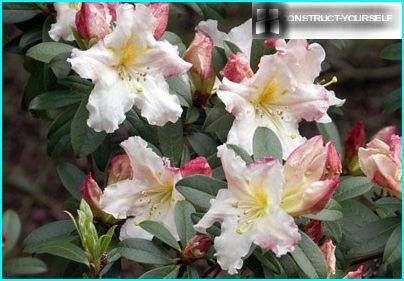 Like most luxuriantly flowering crops, rhododendron rare in Russia's wild and grows only under the supervision of gardeners. Many species take root, and myself greatfelt only in the southern latitudes, so they can be safely grown in the Crimea, the Krasnodar region and the Stavropol region. 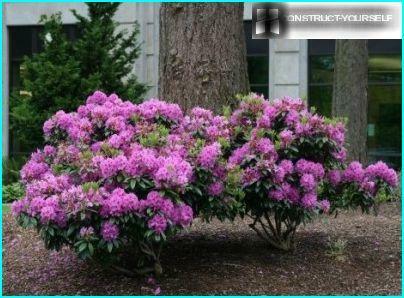 However, some varieties, such as White-naped or Canada, and are thriving in temperate climates, so if you live in the suburbs, in the Urals, or even in the depths of Siberia, rhododendron can also decorate your country site for its magnificent flowering. With a type of rhododendron you certainly know - it's all well-known home azalea, often decorating the sills of city apartments. 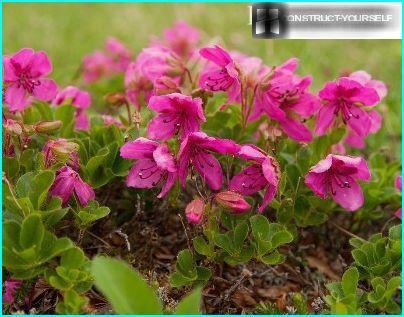 It is characterized by lush flowering and the variety of colors. You can not imagine how this familySmall plants can reach 25-30 meters in height, although in fact, the Himalayas, Japan, North America, some species grow to such gigantic proportions. 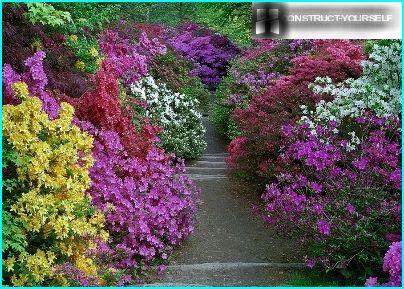 There are low and rhododendrons, which are individual bushes or creeping shrubs to feel comfortable at the foot of the mountains and coastal areas. Among the annuals and perennials (and all kinds of about 3 thousand), you can choose the variety, the characteristics of which are suitable for growing in a certain area. If you need a special color - red,purple, white or yellow - is also not a problem, because the color palette is almost limitless cultures. Flowering begins in early spring culture and continues throughout the warm season. Following the general recommendations, you can fitproduce and autumn, and spring, that is convenient for you growing season, except during a short period of flowering and after flowering - about 10 days. However, experienced growers still insist on spring planting, which continues, depending on the region, from April to May 10-15. Varieties planted before that period, the May holidays are already covered by a dense color - against the backdrop of barely hatched foliage and fresh grassy green they look very impressive. It is important to choose a landing site, as in bright sunlight the plant will be uncomfortable, but in a completely dark place does not give a lush flowering. Flowerbed with rhododendrons best to breakthe north side of the building, on the site poluzatenennom to noon, when the sun's rays reach the maximum power, the plant was completely concealed from them. Flowers absolutely not tolerate alkaline orneutral ground - it must necessarily be acidic, humus-rich, well-aerated, without lime impurities. One of the best materials for the cultivation of a mixture of peat and clay. produce mulching (to a depth of 5-7 cm), which are suitable for peat moss, rotted pine needles, leaves and shredded oak bark. 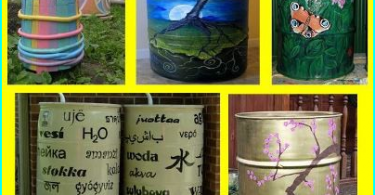 To better plant stuck in a new place,before planting the roots well soaked with water - Lower the seedlings in a container with water until then, until the surface did not stop appearing air bubbles. There is another trick that promotesbetter development of the root system. In flowering plants, cut the most fat buds - so seedling more energy to spend on rooting. 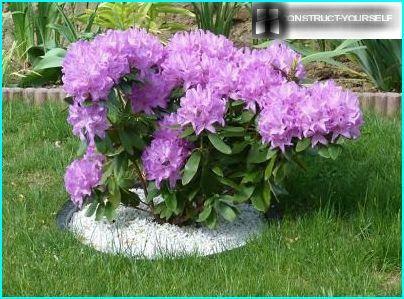 Planting and caring for rhododendrons further - important steps, following which you will achieve amazing results. 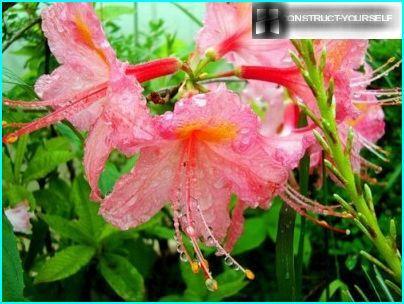 Norms proper care of flowering shrubsno different from the generally accepted standards: it is necessary to comply with watering mode, time makes weeding and pruning, feed the plant is suitable minerals and ensure that no pests are bred. There are subtleties, for example, a gentle approachwhen loosening. 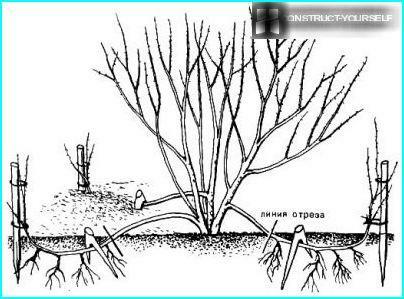 plant roots are very close to the surface, so loosen the soil should be very careful and dig, and does not follow. Removing weeds, in any case, do not use the chopper knife or garden, you can only operate manually. Drinking rhododendron moisture very interesting. On the one hand, it does not transfer completely waterlogged, on the other - requires constant irrigation and spray the specially prepared water. Even during the site selection for the landing check,Does not fit close to the surface of the ground water. The fact that when a large amount of moisture in the soil root simply "choke" and the plant will die. It is therefore necessary drainage layer to drain excess water. Watering is carried out regularly, preacidifying the water - it is for 12-20 hours before watering bowl of water placed 2-3 handfuls of sphagnum peat. Water from the tap is better not to use, in an extreme case, it is necessary to defend. Ideal - rain fees. Frequency of watering depends on the state of the plant as soon as the leaves have lost their glossy shine and turgor changed - it's time to water. cropping concept is very conditional. Typically, the plant forms a uniformly developed and abundantly flowering shrub of regular shape, so do not need to make lovers of lush flowerbeds trimming. But sometimes you want to thin out the bushes, making it just below or just rejuvenate. Pruning is carried out in early spring, has not yet begunsap flow. Choose strong, thick branches with a diameter of 3-4 cm, carefully cut off the ends of the clippers and cuts treated specially prepared garden pitch or resin. About a month will start the update process, which lasts for a year - and hatch new shoots begin to grow dormant buds. Rhododendrons different flowering uneven. If this year you are particularly pleased with riotous color, we should expect more modest results. To avoid this, remove the faded flower buds immediately after flowering, and then the plants have the strength gain as much kidney as possible and in the second year. 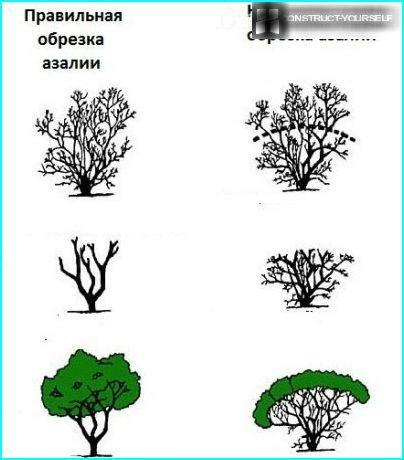 Branched shrubs with dense foliage and plentybuds - the perfect location for insects, half of which is able to destroy the beauty of your grown for a couple of weeks, so to protect the bushes need to take a number of measures. Thick trunks and branches - a favorite placeshellfish. Slugs and snails are harvested by hand. 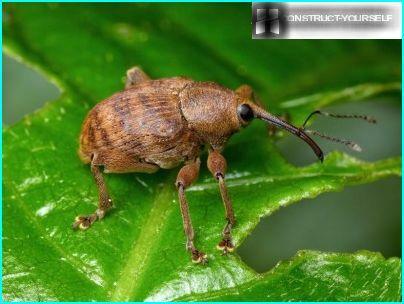 Beware of scale insects, bugs, spider mites, rhododendron flies, mealy worms. Stems and branches treat 8 percent fungicide "thiram" good help "Malathion". 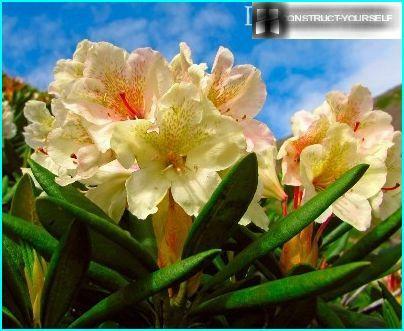 Along with pests rhododendronsthreatened by fungal diseases such as - rust, chlorosis, spotting. The reason lies in the lack of aeration and non-compliance with watering regime. Yellowing, chlorosis appeared as a result of the disease, treat with a solution of iron chelate. If there was mold, affected shoots should be cut off completely. For the prevention of seasonal processing is carried out in late autumn or Bordeaux mixture in early April. 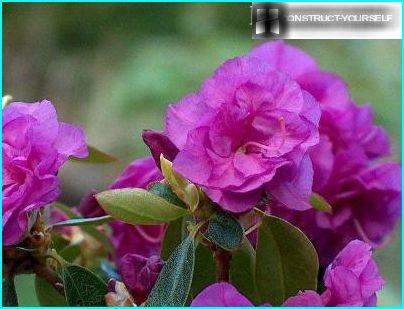 To begin with you need to feed the rhododendronslanding and throughout the flowering period. To save important for the culture medium used acidic superphosphate, potassium sulfate, potassium nitrate, magnesium sulfate or calcium, ammonium, but the minimum concentrations. Early spring feeding is composed of fertilizer,containing nitrogen (1 cu. meter of liquid 40-50 g of magnesium sulphate or ammonium), and it is relevant in the period after flowering. In July fertilizer dose should be reduced to 20 g.
After 1-2 years after planting, you must updatetopsoil. To do this, in equal parts peat mixed with humus or compost, and sprinkle the area around the roots. Along with natural ingredients in podsypku add superphosphate, potassium sulfate or ammonium (solids - 1 tbsp.). As the dry powder can be used "Agricola" for the flowering garden plants. 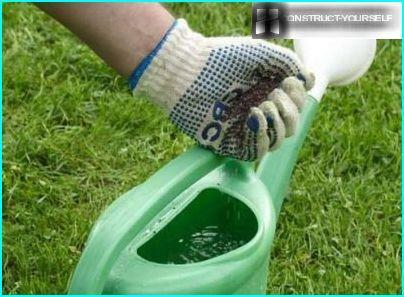 Remember that it is only necessary to fertilize shrubs watered thoroughly. Growing plants from seeds - employment and longconsuming. 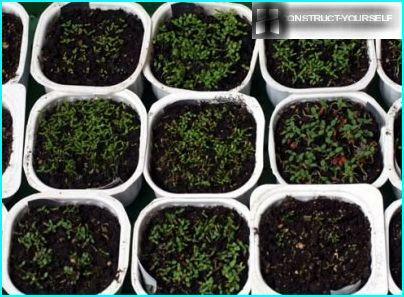 Dry, healthy seeds are planted in pots or boxes with moist peat, add a little sand, cover glass caps and put in a well lit place. Within a month, you need to moisten the soil and remove condensation from the glass. Propagation by cuttings is also maintained, not all gardeners. 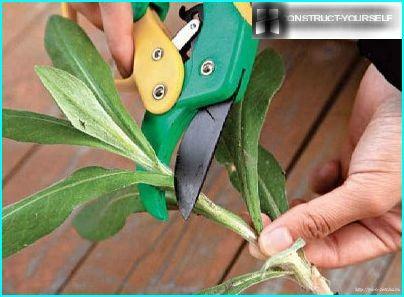 It is necessary to take shoots, half stiff, and cut them out of a few cuttings of a length of about 7-8 cm. Then placed in soil and covered with peat asin the case of seeds. Depending on the type of cuttings take root in 2-4 months, after which they were transplanted into boxes of peat-pine ground and take out in a cool greenhouse. The optimum temperature - 10 ° C?. Planted in the spring, along with other colors, just in boxes, and only a couple of years they can be transplanted to the main locus. The most convenient way of reproduction - cuttings pinning. Take a flexible lower escape, beside him dig the groove depth of 12-15 cm, and the process is laid into this groove. For layering care as well as for allbush - watered, sprayed. 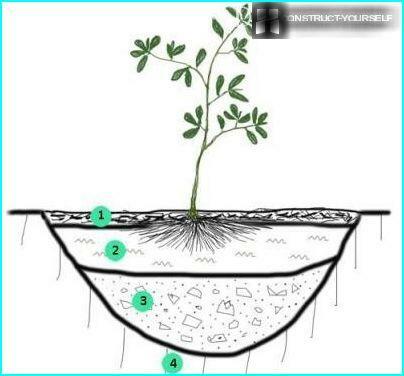 When he is rooted (in the late autumn or spring), it is separated carefully, dig and transplant for permanent growth. 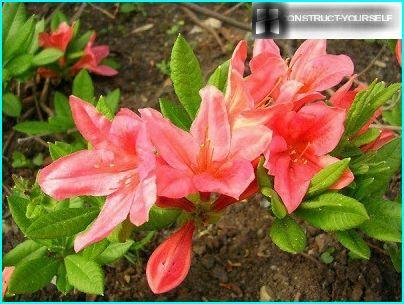 This method is especially good for the propagation of deciduous rhododendrons. In coniferous garden perfectly uzhivetsya 2-3 meter Dauria Rhododendron. It differs abundant flowering buds, reaching a diameter of 4 cm. Rhododendron Adams - East Guest, accustomed to rocky mountain soils. Low creeping Caucasian rhododendron - a real find for rock gardens. 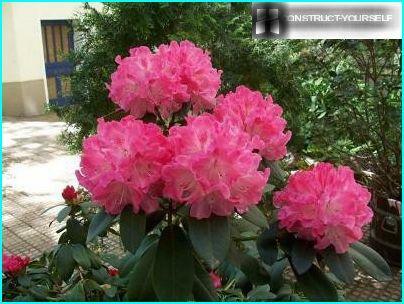 Japanese rhododendron - a great variety with deciduous buds colored flamingos. 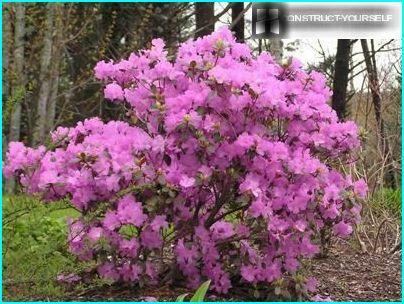 And finally - a short video on how to achieve a lush flowering rhododendrons.